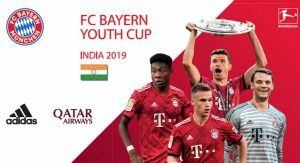 Qatar Airways, in association with German football club giant FC Bayern München AG and Adidas, are proud to announce the sixth edition of the FC Bayern Youth Cup India 2018-19, taking place from the end of November until 3 February 2019 at Adidas, the Base – Plaza in New Delhi, India. Qatar Airways Senior Vice President of Marketing and Corporate Communications, Ms. Salam Al Shawa, said: “Qatar Airways is thrilled to support the FC Bayern Youth Cup 2018-19 in India, further inspiring future generations in sports. Football as a sport has grown tremendously in India over the last decade, and with the recent FIFA U-17 World Cup tournament held in India, the sport is poised for further growth in terms of both participation and interest. 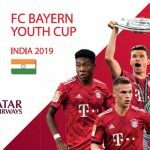 Football legend and former FC Bayern München AG player, Bixente Lizarazu is due to visit Delhi for the national finals taking place in India in February 2019 ahead of the world finals, to encourage participants and give them a glimpse of what is in store for the winning team. Lizarazu has earned varied accolades during his career which includes six times championing the German league, winning the Champions League 2001, the World Cup 1998 and the European Champion 2000 with France. Qatar Airways holds an extensive global sports portfolio, sponsoring some of the biggest teams around the world. In addition to its existing partnership with the German football club giants FC Bayern München AG, for which it is a Platinum Partner, Qatar Airways also recently revealed multi-year sponsorship agreements with Italian football club AS Roma, and with Argentinian football club Boca Juniors, which saw the award-winning airline become the Official Jersey Sponsor for both teams. In addition, Qatar Airways is the Official Global Airline Partner of The South American Football Confederation (CONMEBOL). The multi-year agreement will provide Qatar Airways with maximum exposure in South America, while further strengthening the airline’s global sponsorship portfolio. Qatar Airways also sponsors the NBA’s Brooklyn Nets and the team’s home, Barclays Center in Brooklyn, New York – a venue that hosts many of the world’s most exciting entertainment and sporting events. In May 2017, Qatar Airways announced a groundbreaking sponsorship deal with FIFA, which saw the award-winning airline become the Official Partner and Official Airline of FIFA until 2022. The partnership, one of the biggest sporting sponsorships in the world, will give Qatar Airways extensive marketing and branding rights at the 2022 World Cup Qatar™, with an expected audience reach of more than two billion people. The agreement sees Qatar Airways become the Official Airline Partner of the FIFA Club World Cup™, the FIFA Women’s World Cup™, the FIFA Under-20 and Under 17 World Cups™, the FIFA Beach Soccer World Cup™, and the FIFA Interactive World Cup™.